Kicking off at 7am down near the New Farm Park city cat terminal, New Farm Parkrun is a free 5km run where it’s you against the clock. Run or jog your way along the Teneriffe boardwalk down to the city cat terminal and back to New Farm Park. This weekly event is organised by volunteers. If you are not already a registered runner, visit the website to register. Post Parkrun, why not take a recovery warm down walk through the Jan Powers Farmer’s Markets at the Powerhouse and rehydrate with a freshly squeezed juice or a well-deserved coffee and croissant! Whilst you’re there, you can grab all you need for a great healthy week ahead, farm fresh fruit and veg, meats, seafoods and small goods. 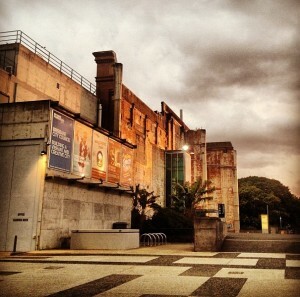 Down at the Brisbane Powerhouse this month is the Contemporary Australian Family Photographic Project. The aim of this project was to photograph the typical Australian family; to make photographs that record the socio-cultural landscape of contemporary family life in Australia today. Photographed over a 12 month period, the results reflect the diverse range, nature and cultural aspects of family life and relationships found today in Australian families and society. If you haven’t already, and even if you have, why not pop down to Teneriffe’s first boutique craft brewery and ale works, Green Beacon Brewing Company. Located in Helen Street, this brewery-meets-bar offers a core range of six beers, plus a seasonal rotating creation and, not to mention the best Queensland seafood. Check out Green Beacon’s website for all they have to offer. Tucked away in the semi-industrial pocket of Newstead, Rogue Bistro + Bar is a perfect location for a Saturday night of wining and dining. Like the décor the food is striking yet simple. So pop down to Austin Street in Newstead and nestled between factories and warehouses is where you will find this little gem. Follow them on Facebook.